On Sunday, February 9th, Our Lady in Her Częstochowa Icon walked in a procession along the city streets from the church of the Most Holy Virgin Mary of the Angels to the church of St. Martin of Tours. The church houses the centre of a women group of night adoration of the Most Blessed Sacrament. After the Holy Mass had been celebrated exactly at noon, the whole day was devoted to individual adoration. The church of St. Martin of Tours is in the centre of the old town. The church has not been a parish church for the last twenty years. At present it is the Diocesan Centre of Eucharist Prayer, where the adoration of the Most Blessed Sacrament lasts for the whole day. The church is surrounded by narrow streets typical of an old town. Everywhere you find the entrance by car and parking forbidden. It is a rather dangerous district. Prostitutes offer their service in the streets. It was difficult to park the “Life Mobile” near the church. The driver and the caretaker of the Icon wanted to stop at a central place next to a police car. However the policemen did not allow this because of the traffic ban on the square. They told the driver to park the car at a place for delivery vans along a building near the church. There was very little space and the driver, stressed by the situation, called the Mother of God for help in his heart when he was parking. 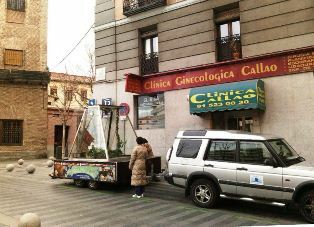 When he managed to do it in one go he was grateful and he got out of the car and … he saw that the “Life Mobile” was standing precisely in front of the Callo gynaecological clinic (an abortion centre), almost blocking the entrance. Many people supposed that the “Life Mobile” was parked there on purpose but in fact the place was indicated by the local police. The car stood there all day. It seems that the Mother of God had herself chosen the place. There was something exceptional about it – the women who were going to the clinic stopped at the “altar of wheels” and read the banners. Some of them seemed to be praying. Others, encouraged by the organisers and led by curiosity entered the church, where prayers continued. The activists of the pro-life movement, the so called saviours of the last chance, started conversations with them trying to make them decide not to kill the conceived child. Many women from the neighbourhood came to see the Icon. We are confident that the Mother of God has taken them in Her care. At 7 PM father Fernando Simon, the Diocesan Pastor of Families presided over the Holy Mass. The church was filled with a crowd of over 500 people. Next the Icon was carried to the “Life Mobile”, which, beautifully lit, went along the main streets of Madrid to the chapel of the Missionary Sisters of the Most Blessed Sacrament Cachito de Cielo (A little piece of Heaven), where permanent adoration is also held. It was a cool Saturday evening. Since 8 PM many youth groups, led by such communities as: “Spei Mater”, kerygmatic and “St. Paul”, had been waiting to welcome the Icon. After the Icon of Our Lady was carried inside it turned out that there is not enough space for everybody. Some simply sat on the floor, but around 200 people had to stay outside. The missionary sisters of the Most Blessed Sacrament, M. Margarita – the superior and sister Maria Inmaculada, reminded the congregation the history of the Czestochowa Icon and the idea of the peregrination. Father P. Jesus led the prayers. The queue to approach the Icon was very long. The adoration lasted till midnight. On the next day, on Sunday morning the chapel “The Piece of the Sky” was visited by the representative of the Russian Orthodox Church Archipriest Andrey Kordochkin and all the people escorted the Mother of God to the Orthodox Church of the Birth of Jesus.